Memories and healthy recipes for your dinner table. The first time I had pesto was with my friend Tammy. She was making pesto with pasta for a girl’s night out pot luck. I was in love at first bite. The history of basil begins in the regions of Liguria, Italy. This region of the country is extremely fertile and thus known for it’s rich abundance of vegetation; particularly basil. Pesto or Pesta (meaning to pound) comes from the act of crushing the basil leaves, oil and nuts with a mortar and pestle until creamy and smooth. Pesto is best noted as a sauce for pasta. Traditionally that is true however the Italians and Persians enjoyed pesto with boiled potatoes as well. 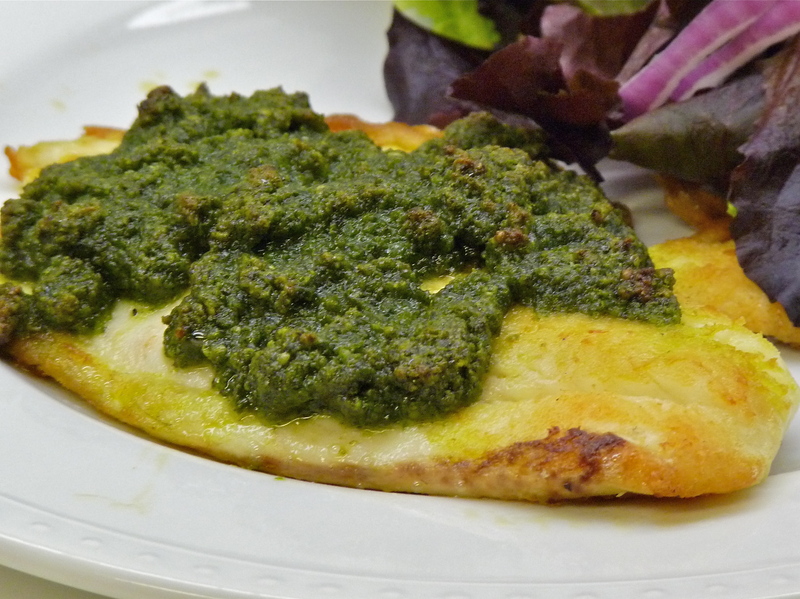 Tilapia with pesto is by far my favorite Dazzledish recipe. I love pesto first of all. Then add a creamy light fish such as Tilapia and you have a match made in heaven. Toast pine nuts in a pan over medium heat until golden and fragrant. Process pine nuts and garlic in a food processor until it a smooth paste forms. Add the basil and cheese; processing until completely blended and smooth. Slowly drizzle in the oil while the processor is on. Season with salt and pepper. Season the tilapia with salt and pepper on both sides. Heat a large oven proof sauté pan over medium-high heat. Add oil. Cook the fish for 1 to 2 minutes (If using fresh fish start on the flesh side) or until it turns light golden brown. Flip the fish over and spoon the pesto generously over the fish. Transfer pan to the oven and continue to cook 5 more minutes or until the fish is cooked through. Serve with a salad of mixed greens for a complete meal.